ClinicalKey Student is a brand new medical learning platform from Elsevier with alomost 250 textbooks, 850 videos, 85 000 pictures and 1500 clinical summaries that all are searchable through common search interface. The books are also available in Oria, but access requires that you log on. (see blow for more information). NB! Access requires that you create a personal user and log on to to new platform (also if you are only going to read the books). It is necessary to be connected to the NTNU network when you create a personal user, but later you gain access by logging on only (regardless of the network you are using). 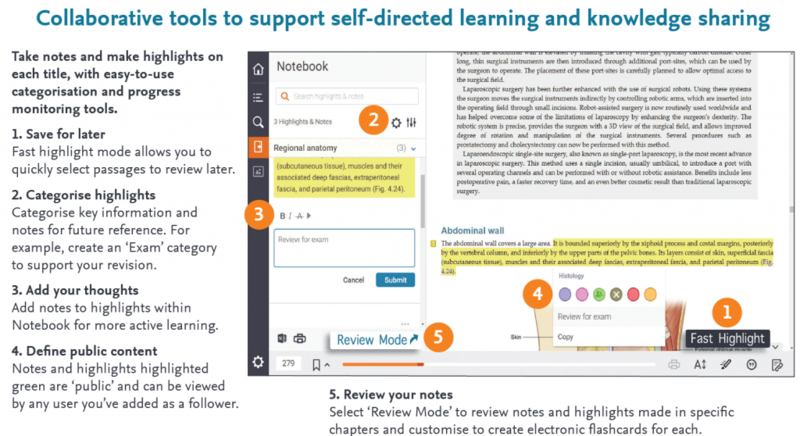 ClinicalKey Student has a Study Tool module that makes it possible to store bookmarks, highlighting, adding notes etc. It is also possible to share these with other students using ClinicalKey. Students and teachers can also create tasks that can be shared with others. You can download a Study Tools ClinicalKey MedEd app from iOS and Android app stores to read, make notes and work offline in Study tools.